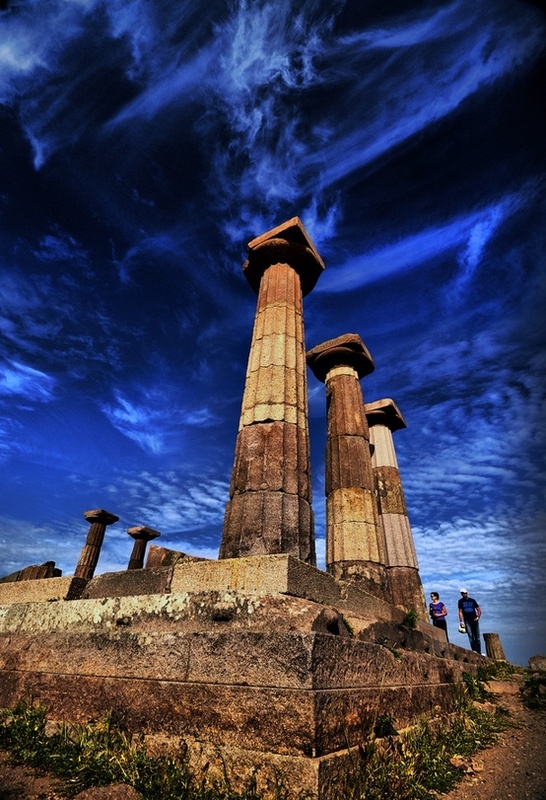 Assos, Cannakkale, also known as Behramkale or for short Behram, is a small historically rich town in the Ayvacık district of the Çanakkale Province, Turkey. After leaving the Platonic Academy in Athens, Aristotle (joined by Xenocrates) went to Assos, where he was welcomed by King Hermias, and opened an Academy in this city. In the Academy of Assos, Aristotle became a chief to a group of philosophers, and together with them, he made innovative observations on zoology and biology. When the Persians attacked Assos, Aristotle fled to Macedonia, which was ruled by his friend King Philip II of Macedon. There, he tutored Philip’s son, Alexander the Great.There is a modern statue of Aristotle at the town entrance. Though perhaps best known for his scientific treatises, Aristotle also published his Ethics and Politics, and his influence in these areas also reached Alexander. Aristotle asserted this influence particularly with regard to the so-called barbarians–a term that was used to characterize essentially all non-Greeks. Alexander himself was already passionately anti-Persian; and Aristotle provided him with the intellectual justifications for his fated and inherited mission. Aristotle believed that slavery was a natural institution, and that barbarians were by nature meant to be slaves. He therefore encouraged Alexander to be a leader to Greeks and a despot to barbarians, treating the former as friends and the latter as beasts. 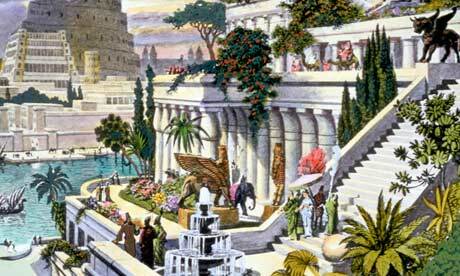 A British academic has gathered evidence suggesting garden was created at Nineveh, 300 miles from Babylon. The whereabouts of one of the seven wonders of the ancient world – the fabled Hanging Garden of Babylon – has been one of the great mysteries from antiquity. The inability of archaeologists to find traces of it among Babylon’s ancient remains led some even to doubt its existence. After 18 years of study, Stephanie Dalley of Oxford University has concluded that the garden was built by the Assyrians in the north of Mesopotamia – in modern Iraq – rather than by their great enemies the Babylonians in the south. The evidence presented by Dalley, an expert in ancient Middle Eastern languages, emerged from deciphering Babylonian and Assyrian cuneiform scripts and reinterpreting later Greek and Roman texts. They included a 7th-century BC Assyrian inscription that, she discovered, had been mistranslated in the 1920s, reducing passages to “absolute nonsense”. Having first broached her theory in 1992, Dalley is now presenting a mass of evidence in a book, The Mystery of the Hanging Garden of Babylon. She expects to divide academic opinion, but the evidence convinces her that Sennacherib’s garden fulfils the criteria for a wonder of the world – “magnificent in conception, spectacular in engineering, and brilliant in artistry”. A small church on the outskirts of Milan containing archaeological finds from early Christendom has been declared a heritage site. Excavations of the Church of Saints James and Philip, which began in March, led to discoveries that are especially important to the history of the Lombardy region and its earliest inhabitants. Findings related to the community, once known as Nocetum, include tombs of an infant and an adult, and coins dating from the time of Roman emperor Magnentius, usurper of the empire from 350 to 353. The church was undergoing restoration due to damage caused by humidity, and was declared to be of historical interest by the Superintendence for Cultural Heritage for Lombardy.